You probably hear lots of speculation from friends, family, and everyone else you talk to that hears that you may be in the market to buy or sell a home… but how do you really know which type of market you’re in? 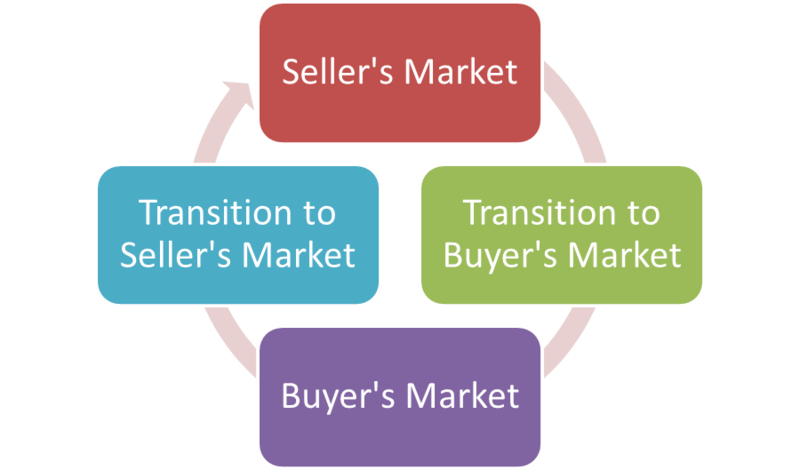 Is it a seller’s market, a buyer’s market? Or is it a transitional market? Let’s start with the most recent widely understood type of market, the Buyer’s Market… this is when inventory is high and buyer demand is low. There are tons of homes to choose from and not much competition – buyers are able to negotiate with the most advantage since they are in the driver’s seat. Sellers are fighting to attract buyers by lowering their listing prices and offering crazy incentives such as no closing costs, new appliances, carpet allowances and even throwing in cars and personal property. This is the type of market we’re just beginning to come out of after the most recent real estate market crash. Then comes the Transition to the Seller’s Market which is marked by an increasing buyer demand with declining inventory with sales prices stabilizing and eventually increasing. The decline in inventory and increase in demand drives prices up which pushes us into a Seller’s Market. A Seller’s Market is when buyer demand is high, inventory is low and sales prices are high. Prices will continue to go up until buyer demand cools off. Once buyer demand begins to slow and inventory starts to increase with sales prices stabilizing and eventually declining again – we’ve entered the Transition to a Buyer’s Market. The Transition to the Buyer’s Market shows declining buyer demand with increasing inventory. When seller’s capitulate and start dropping prices again, we’ll be back into the Buyer’s Market. There’s a much more involved way that utilizes a calculation to determine which type of market we’re in however this is an easier and more instinctual way to figure it out and utilizes all that stuff your friends and family are telling you! For more information about the current market and to find out how to stay ahead of the cycle, please feel free to contact me via email or phone by clicking on ‘About Me’ at the top of this page.